ISIS 'Are Not Muslims, They Are Monsters,' Cameron Says : The Two-Way This weekend, David Haines' family publicly asked his captors to contact them. Instead, the group released its third video showing a Western hostage being killed. A frame grab from a video released by the Islamic State shows an IS militant holding a knife before purportedly executing British aid worker David Cawthorne Haines. Vowing justice for murdered aid worker David Haines, Britain's Prime Minister David Cameron says his killing by extremist group the Islamic State is "an act of pure evil." A video purporting to show Haines' beheading was released Saturday. That video was released on the same weekend that Haines' family had publicly asked his captors to contact them. Instead, the group released the video, the third to show a Western hostage being killed in the past month. Calling Haines a "British hero" who was an innocent in the fighting that has consumed much of Syria and swaths of Iraq, Cameron said, "We will do everything in our power to hunt down these murderers and ensure they face justice." Cameron spoke about the killing Sunday, after meeting with his emergency response team at 10 Downing Street. He pledged to work with Britain's allies to destroy the Islamic State, saying of the group's members, "They are not Muslims, they are monsters." Haines, 44, had spent much of the last 15 years working for relief agencies. Before he was kidnapped in Syria in the spring of 2013, he had worked with the U.N. and several charitable agencies in the Balkans, South Sudan, and Libya. He was also a husband and the father of two daughters, ages 17 and 4. "David was like so very many of us, just another bloke," his brother, Mike, said in a statement released Saturday, in which he describes how his brother dedicated himself to humanitarian work after leaving Britain's Royal Air Force. 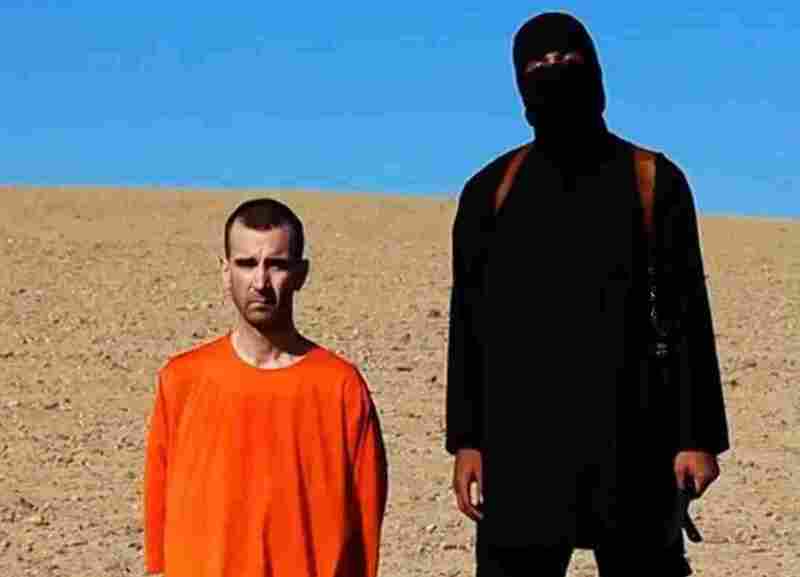 As was the case with American journalists James Foley and Steven Sotloff, the video shows Haines wearing an orange shirt, kneeling in a desert alongside a militant who is dressed in black and is armed with a knife. "My name is David Cawthorne Haines. I would like to declare that I hold you, David Cameron, entirely responsible for my execution," Haines said, according to the BBC. Haines then said he was being punished for Britain's policies. The BBC reports, "The militant, who appears to have a British accent, is then recorded as saying: 'This British man has to pay the price for your promise, Cameron, to arm the Peshmerga against the Islamic State.'"